[Almost certainly] ordered by Cardinal Joseph Fesch (1763-1839), uncle of Napoleon I, for his Roman residence, Palais del Buffalo-Ferraioli. This table is almost certainly one of thirteen giltwood gueridons with porphyry tops made for Cardinal Joseph Fesch (1763-1839), uncle of Napoleon I. Fesch was the son of Angela Pietra Santa, whose daughter from her first marriage, Laetitia Ramolino, was the wife of Charles Bonaparte and mother of Napoleon I. In 1796, Napoleon appointed his uncle Fesch Commissioner of War for the Italian Army. From 1800 he lived in Paris in the former hôtel Hocquart de Montfermeil. Appointed Archbishop of Lyon, Primat des Gaules in 1802, he became a Cardinal in 1803, the year that Napoleon sent him as to Rome as minister plenipotentiary to the Holy See, where he held the position until 1806. Fesch undertook a grand scheme for decorating his Roman residence, the Palais del Buffalo-Ferraioli, and the refurnishing of his Parisian residence, both in the 'Antique' taste adopted by his nephew's regime. He bought a great amount of vases, columns, and bas reliefs in porphyry, granite, and other precious marbles. He also commissioned furniture in giltwood designed by Roman artisans after drawings by architects Lorenzo Santi (1783-1839) and Dionisio Santi (1787-? ), which were later engraved in M. Santi's Modèles de meubles et de décorations intérieurs pour l'ameublement, Paris, 1828. 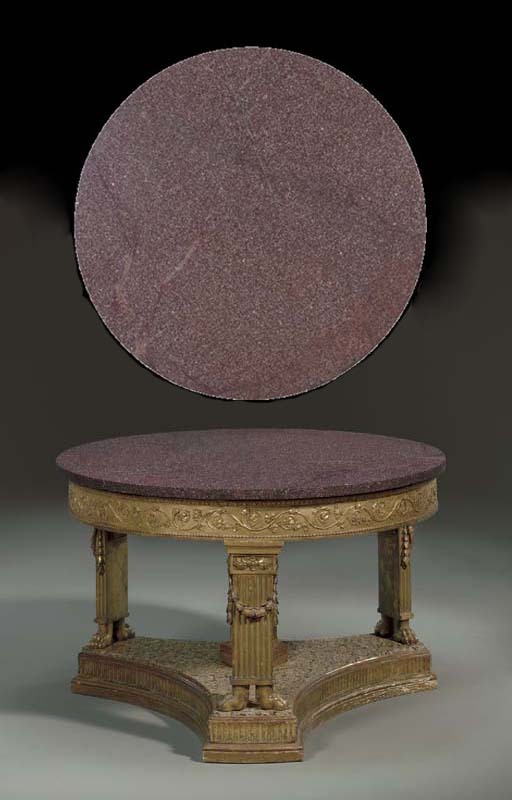 For the suite of porphyry-topped tables, it is presumed that the Cardinal acquired a large column base, which he had sliced into plaques as tops for a series of gueridons, all with giltwood bases and a platform of pink Egyptian granite. It is most likely that the porphyry was cut from an ancient column, due to the descending measurements of the tops which would correspond to the column's shrinking diameter. (P. Malgouyres, Porphyre: la pierre poupre des Ptolemees aux Bonaparte, Paris, 2003, p.180). Three other gueridons from this commission have been identified: a gueridon in the collection of the Louvre since 1889, the top 128 cm. in diameter and supported by three spread-winged griffons, with palmette-carved frieze, illustrated in P. Malgouyres, p. 181, no. 70.; a gueridon with Gismondi Gallery, Paris, in 1996, the top 116.5 cm. in diameter, supported by three pilasters ending in adorsed paw feet and headed with fluted scrolls flanking Mercury masks, with scrolling-foliate-carved frieze, illustrated in J.N. Ronfort, "Une Table en Porphyre Antique du Cardinal Fesch et son Reémploi au Château d'Eu', exhibition catalogue, La XVIIIe Biennale Internationale des Antiquaires, Paris, 1996, p. 69 ; a gueridon with Didier Aaron, the top 105.5 cm. in diameter and supported by three winged Atlas figures and palmette-carved frieze, previously sold Christie's London, 11 December 2003, lot 126 and illustrated in G.B. Pallot, Didier Aaron exhibition catalogue, Paris, 2004, no. 47. "No. 66, 67, and 68; Une idem (table ronde de porphyry rouge) de 3 pieds 7 pouces (116.4 cm) de diametre, montee sur pilastre canelle, de forme hexagone et soutenue aux extremites par trois pilastres aussi canelles, ornes de guirlandes, surmontes de tetes de femme, termines par des pieds de lion et poses sur un socle trianagulaire de granit rose d'Egypte. La monture est de meme beaute que les precedentes." Under No.s 60 and 70 one finds two other similar gueridons, with smaller diameters of 3 pieds 3 pouces. Other gueridons are listed with simpler pilaster uprights, which must refer to the model offered here. At the 1824 sale eight of the ten porphyry gueridons were bought by the Duc d'Orleans, future Louis-Philippe. The Romans were the first miners of deposits of porphyry in Egypt where they extracted the famous purple stone which derives its name from the Greek word for purple. Porphyry was then considered as the most noble decorative material and the most expensive, due to its hardness and the remoteness of the deposits. The Romans imported porphyry in great quantities from ancient Egypt, using it both in architectural schemes and to carve portrait busts. Its rich purple color corresponds to the Imperial symbol of power, and therefore had special significance. Subsequent production of porphyry objects was the product of recycling of discovered elements and pieces from antique constructions, such as vases, pavements and columns. Porphyry was avidly collected by powerful figures such as the Medicis, Louis XIV and the cardinals de Richelieu and Mazarin. Its desirability is demonstrated by Louis XIV who purchased for the astronomical sum of 1089 livres from the disgraced Nicolas Fouquet a round tabletop of 4 pieds 5 pouces (143.5cm) that he then had mounted in 1669 upon a giltwood support by Philippe Caffieri. This table is now in the collection of the Louvre and illustrated in Malgouyres, p. 123.